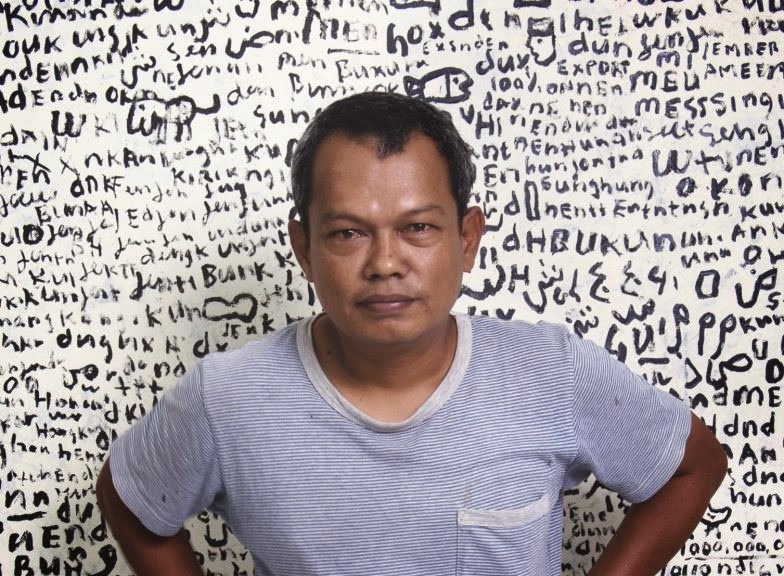 Indonesian artist Yunizar, a leader member of the prominent art collective Jendela, has just opened a solo exhibition at Gajah Gallery, running until November 11. As well as presenting several paintings the new show also includes a series of bronze sculptures, a relatively new medium for the artist who has been experimenting with the patina process to perfect his color vision. Blouin Artinfo spoke to the artist about the show, his 2015 plans and his bird breeding hobby. Tell me about your current exhibition at Gajah Gallery and your move toward sculpture? The exhibition features new canvas works and bronze sculptures that I have recently developed at the Yogyakarta Art lab. For me, working in three-dimension was a natural step to take in my artistic practice, to open up a new avenue for my creative expression. Sculpting requires me to work in a more structured, methodical way towards a final work of art, whereas painting affords me the luxury of being more fluid and open. How do these fit with your previous works? Similarities can be found in the finished works, with the sculpture showing lines and forms found in my paintings. Like all my previous works, my art is firmly anchored in the aesthetic realm. My artworks hold no explicit agenda or subtexts which give the viewer freedom of interpretation. Right now, I am in the midst of developing more bronze sculptures at the Yogyakarta Art Lab. I live very near their studio which I visit almost every day to keep close tabs on the production. In addition, I will be participating in a group exhibition in Havana, Cuba, sometime mid-November, to which I will be contributing a recent canvas work; Personally, this is a very exciting exhibition for me, as this is the first time I am exhibiting in the Caribbean with my Indonesian counterparts: Handiwirman Saputra, Alfi Jumaldi, Mangu Putra, to name a few. The year will start off with me showing at Art Stage Singapore. I have been showcasing with Gajah Gallery at the fair since its inception and each year has been fruitful for the gallery and me. The momentum will continue to Art Basel Hong Kong in March. Further into 2015, there are tentative plans for me to exhibit outside Asia. However, plans are not firmed yet. I also see myself busy with the Art Lab and hopefully produce a more ambitious sculpture, in terms of size and detailing. Like most artists, I require the basic necessities, like books, catalogues, work tools, furniture, etc... However, the one thing that is imperative for me to produce art would be the comfort and freedom of expression. My ideas are usually conceived from my “rasa” which in English translate as the sum of the senses: feeling, taste, flavor, sensation, etc. I tend to ignore aesthetic trends happening around me. Images of my works are extracted from my daily life which tends to project impressions of my cultural background. My studio and art museums in general. I get excited whenever I come across objects that have the same artistic quality with my works and ideas. Some of these objects include tools and artifacts with historical significance. However, I rarely collect these items. If there are any items at home, they are only limited to decorative purposes … nothing more. I rarely buy a work of art. Generally, I barter my work with artists who express interest in them. A recent artwork I acquired through bartering is the work of an Indian artist, Jōgen Chowdhury. He was invited to my studio by my gallerist Jasdeep Sandhu. I had immensely enjoyed my interactions with Jōgen and ended up painting and exchanging artworks. Venice Biennale is right at the top of my list. I do not have a particular artist that I favor as there are a lot of great artists out there. In general, it is the work progression of other artists that inspires me. And not only established artists but also the emerging artist, whose enthusiasm and energy rub off on me. I like to play Futsal and I usually do it once a week with my fellow artist friends in Jogjakarta. I am also a keen breeder of birds and have allocated a huge portion of my garden for them. Some of my birds are already proliferating.